You could become a regular diver, if you have a thrill to dive underwater to explore the breathtaking world below the sea-level, or you could take it even further and become a PADI diver. That sounds like a great title to have? You think you’ve got what it takes to become a PADI, and would like to go through the experience, get the badge? Well, then read on here to know more. First off, PADI is short for Professional Association of Diving Instructors, so by taking our courses at Nautilus Diving Center, you’d go through a range of tests to become a certified PADI diving instructor. No matter if you have tried scuba diving before, or even if you’re new to the world of diving with an oxygen tank on your back, you can sign up for one of our courses, taking you from being a hero on land, to becoming a hero below water-level. Divers are members of a special community, and with a PADI course, you can now even get certified. You’ll have plenty of chances to get a close up encounter with marine life, but first things first, first you need to practice. Your first step would be to take an entry-level certificate, but you can take more advanced courses, as you go along, so you’d be ready for all sort of situations that you meet underwater. At Nautilus Diving Center in Phuket, we have a range of highly experienced and certified divers who each individually has many years of diving behind them. They’re practically more comfortable walking the seabed than walking down a busy beaten path elsewhere on the island, that’s for sure. Discover the magical sea-world together with us. 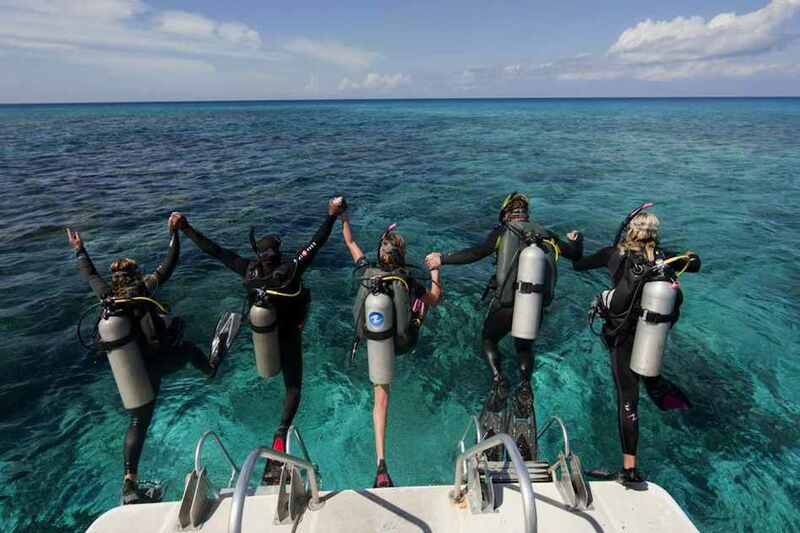 If you’ve always wanted to take scuba diving lessons, experience unparalleled adventure, and see the world beneath the waves, this is where it starts. Thousands of people have learned to scuba dive, and gone on to discover the wonders of the aquatic world through this course. When will you take the step and learn it too? In order to enroll in a PADI Discover Scuba Diving Course, you must be 10 years old or older. You need adequate swimming skills and need to be in good physical health. No prior experience with scuba diving is required though. If you don’t have the time for a full training, but would like to experience the ease and thrill of diving, join us for our half or full day program at Nautilus Diving Center instead. Our instructors will teach you basic theory and familiarise you with the equipment before accompanying you an a beautiful, controlled dive on limited depth. For the more advanced water-adventurer, we also offer a range of other PADI courses and have other suitable packages available for your choosing. If it’s been a while since your last dive, or you feel that your skills and knowledge are a little “rusty”, then take the PADI refresher course. Our instructor will review your last diving theory and skills and make sure that you haven’t forgotten anything. The half day course includes classroom and diving training in shallow, confined water. The new 2 day PADI Scuba Diver rating is a pre-entry level certification that allows you to dive to a maximum depth of 12 meters / 40 feet under the direct supervision of a diving professional. Here you have the chance to expand and continue your diving knowledge and experience in the care of a PADI Instructor. You will complete 2 “core” dives – underwater; navigation and deep diving – after receiving academic training in these areas. You will also select and complete 3 “elective” dives in areas such as multilevel diving, night diving, drift diving, photography, underwater naturalist, boat diving and search and recovery training. The Advanced Open Water Diver Course can be combined with beach dives or daytrips. You simply choose what option interests you the most. If you have any difficulty deciding, your instructor will be pleased to help you choose the special training that is right for you. The PADI Medic First Aid course is a a basic course in cardiopulmonary resuscitation and emergency care. Here you learn simple, logical steps that you can take to assist somebody who needs help. With practical application and hands on experience, this course becomes beneficial for both diver and non-diver. The PADI Medic First Aid course meets the certification requirements of several PADI Courses. You’ll find the course enjoyable and highly interesting, although the nature and context in which such training may be used is quite serious. The primary objective of this course is to prevent the need for use of rescue skills. A good diver does not only solve problems, he prevents them from happening in the first place! You will do 5 academic sessions and 12 open water training exercises over a minimum of 2 – 3 days. The PADI Rescue Diver rating is a prerequisite for all PADI leadership programs. Nautilus Diving Center is located right on Karon beach with just a few steps from the sea. Our divers are very familiar with all local dive sites around Phuket, as well as far beyond that. We also hold surf lessons and we rent out kayaks, surf, SUP and boogie boards for beginners and for professionals as well. Ready to get started? Get in touch with us to know more!